Thanks to everyone for attending today. Unfortunately I cannot stay for the whole of the meeting as I have to rush back to speak at Unite’s fringe on Brexit in thirty minutes. Firstly, as the position of the Venezuela Solidarity Campaign has been caricatured in much of the media, I’d like to draw your attention to our statement on recent events on your seats. I also want to say that Unite has been a long time supporter of VSC. We are not fair-weather friends – neither are we uncritical friends. This is a most difficult time for the people of Venezuela. With turmoil in the country and a pending ‘attack’ by the USA. In terms of that topic of today’s event, alarm bells were ringing around the world recently when Donald Trump’s said he would not ‘rule out a military option’ when it comes to Venezuela. He followed this up by introducing sanctions aimed at strangling the economy and articulating his support for ‘regime change’ in Venezuela. Such US led ‘regime changes’ have been a disaster in other countries in recent years and there’s no reason to believe it would help the people of Venezuela. Already food imports have been blocked due to these sanctions, which will hit all the people of Venezuela. There is currently deep political polarisation in Venezuela, primarily driven by severe economic difficulties, fuelled by the collapse in oil prices, and undoubtedly worsened by some sections of right-wing opposition seeking to use their economic power to sabotage the economy for political ends. 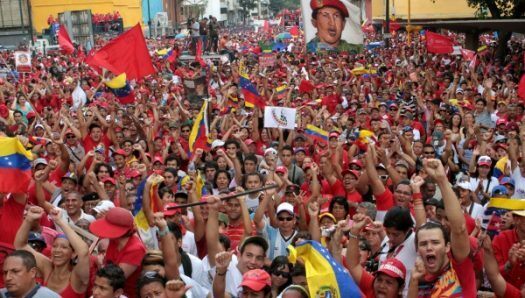 Serious analysts agree that both the Government and the right-wing opposition maintain the support of millions of Venezuelans, as recent elections and an opposition-called plebiscite showed. What is needed in such a situation is dialogue as a way for Venezuela to peacefully resolve it’s current difficulties, and the current talks in Dominica between the government and opposition have been widely welcomed internationally. Dialogue has to be based on all forces renouncing violence as a way to achieve political ends, and the rights of the Venezuelan people being guaranteed. Violence to overturn constitutional mandates – including that of the democratically elected President – should be opposed. As Venezuela’s right-wing opposition becomes more emboldened through a series of recent attacks, we risk a return to the days of the 2002 coup attempt against Hugo Chavez. In this context, a peaceful solution is the only option. Governments internationally, including Britain and the EU, should do all they can to facilitate and support such a dialogue process and help peacefully resolve the country’s difficulties, constructively engaging with Venezuela. Instead of such an approach, the Trump administration is introducing unilateral US sanctions and threats of military force against Venezuela. These will not facilitate dialogue, but exacerbate the country’s difficulties and divisions. In light of the US’s history of intervention in Latin America, including backing the 2002 military coup against Hugo Chavez, it is hardly surprising that polling suggests the majority of both opposition and government supporters in Venezuela oppose the US widening economic sanctions. However, this is not the position of the whole international community. Proposals for the EU to follow Trump with its own sanctions have met with some scepticism. President Macron of France has indicated his support for dialogue in Venezuela, and it has been reported that the governments of Portugal and Greece do not believe sanctions are the best way forward to help improve the situation. Those who actually want to help Venezuela out of the current crisis – rather than simply using it as a stick with which to beat Jeremy Corbyn, as the right-wing press do – should put their efforts into supporting peace and dialogue. This entry was posted in Labour Party, Media, Trade Unions, Unite The Union. Bookmark the permalink.